Despite my growing collection of Nintendo's amiibo toys, it's hard to ignore the obvious fact that they don't contribute much to the on-screen action in any particular game. And, while both Skylanders and Disney Infinity figurines offer the ability to bring characters in and out of the game, this also feels like a somewhat unnecessary (albeit cool) method of purchasing DLC content. So, I wondered, can this whole toys-to-life genre really go beyond the gimmick of watching a character "magically" pop up on screen when you scan in a figure? Enter LEGO Dimensions , which answers this question with a resounding "yes." 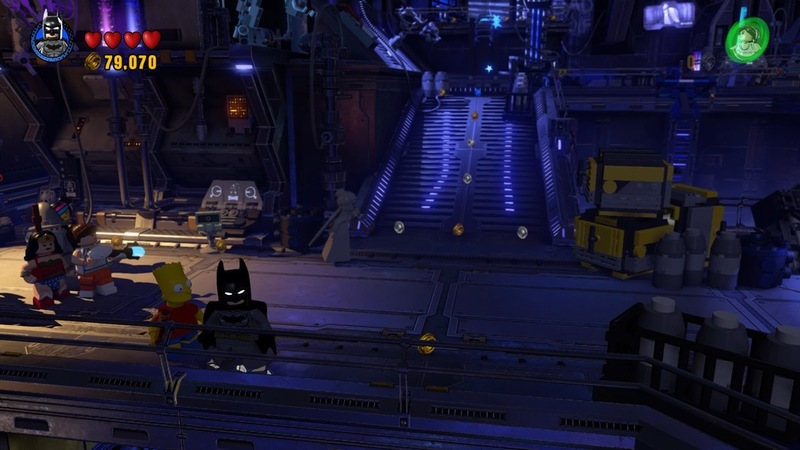 While the basic appeal of LEGO Dimensions is obvious—classic Traveller's Tales LEGO gameplay with lots of great properties all mixed together coupled with the ability build physical LEGO that appear on-screen when scanned—the most innovative part of this whole package is the ongoing interaction between the digital and physical worlds via the portal. Throughout the game, key bosses and environmental puzzles will cause one or more of the three portions of the portal to light up in various colors requiring you to physically move minifigures around. At first blush, it may sound simple, or even distracting, but it pairs well with the not-too-hard action for which LEGO video games have become known. This added layer of solving a puzzle by moving a character to a lighted space, gaining an elemental ability by positioning the right figure in the spot, or unsticking your favorite ally by removing him or her from the red portion of the pad (and, thereby, the villain's grips) makes it feel like there is a real point to having your collection of minifigures and other contraptions lined up next to you on your couch. In nearly all other toys-to-life games, once you've scanned in a figure, that's it—and that honestly seems like a waste. Nintendo's amiibo line is a lovingly-crated set of sculptures, but they aren't very fun in the context of any particular game, nor do they feel vital even in the slightest. Of course, even with LEGO Dimensions, there are plenty of moments when it's simply about scanning the right character in for an ability that can help unlock a certain part of the environment—something that would feel right at home in, say, Skylanders—but that's not the only interaction with the physical toys, and that makes a big difference. As a side note, I do have to give special mention to the fun character interactions that can occur in this game, both within and across the various universes brought together. For example, Gandalf may reference Gollum's search for the ring if they're onscreen together; an obvious but nice touch. More excitingly, though, if you have Batman (DC Comics) and Bart Simpson (The Simpsons) on a team together, Batman will wonder aloud "...could this child be the elusive "Bartman?" It's great to see the developers really play with the mixed properties in a way that fans might if they were simply playing with a bunch of LEGO sets on the living room floor. I still have a little more than half of the main campaign left to complete, at least one more level pack extra mission to complete (I already played through the brilliant Portal 2 level and still have the Ghostbusters left), and I've barely scratched the surface of the expansive adventure worlds for each franchise. Even with so much of the game ahead of me, the sheer brilliance of the way in which LEGO Dimensions brings the real and digital worlds together in a way that no other similar game is doing makes me confident in saying this game is well worth your attention. If you're still not convinced, I'll leave you with this image: Wildstyle from The LEGO Movie riding the Batmobile jumping out of the Simpsons' house, followed by Owen from Jurassic World and Batman. That has to make you smile a little, right?